That sentence, if ever uttered by Nicky, is my greatest fear. He has never said that, but he’s come close to it enough times to throw me in despair. It’s the type of emotional bleeding that occurs when a parent truly understands their child’s medical fragility. We know very well that the unexpected can and does happen, that our children are vulnerable. It is a grieving awareness, an in-your-face understanding of a bitter and unimaginable reality. All I ever wanted was for Nicky to be happy. Being happy though, in my book, it would mean that he’s in the least pain as possible, and lately that is simply not happening. It used to be that I craved for Nicky to get some sort of interaction outside these four walls. I thought that would make him happy. I remember well how happy he was in Elementary School with all his buddies, but as it stands, Nicky does not have any friends aside his online ones. He left all his friends back at Joshua Elementary when he went to middle school and he never had a normal friend since, except, of course, others with EB that he sees at camp etc. Nicky does not want to go anywhere either, it’s just too hard. He’s too heavy for me to lift him, just the action of me lifting him and putting any pressure on his skin would tear his skin right up anyway. Transferring takes a while now and a lot of the time he gets blisters on his feet from doing that, blisters that turn into wounds that take up to months to heal. He is perfectly happy being at the computer all day interacting with his online friends and forget about the pain. I wish things were different, but there you have it, I have learned to accept Nicky’s reality. All I care now is for him to be happy with his online friends. If not going anywhere and just spend his day playing video games makes him happy, so be it. Unfortunately lately, his pain level is through the roof, even CBD oil is not helping much. As he’s spiraling down, my mood goes with it. A mother, as they say, is only as happy as their unhappiest child… it’s so true. Yes, Connor is GREAT help, and my husband is always there to hug me and hear me out, but my mood is almost bipolar lately, and I hate it, because that’s not “who I am”. It scares me. Being in a community where children and adults with EB die all the time, I wish I could say you get used to hear when one dies, it happens often enough. I never did. I don’t want to. It tears a hole through me whenever somebody dies, no matter the circumstances. I don’t want it to “not matter.” I don’t want it to be something that just passes and we all forget about it. My scars are a testament to the death of dreams, death of amazing people who deserved better. And if the scar is deep, so was the love. Scars are a testament to life, a testament that I can love deeply and live deeply and be cut, or even gouged, and that I can heal and continue to live and continue to love. 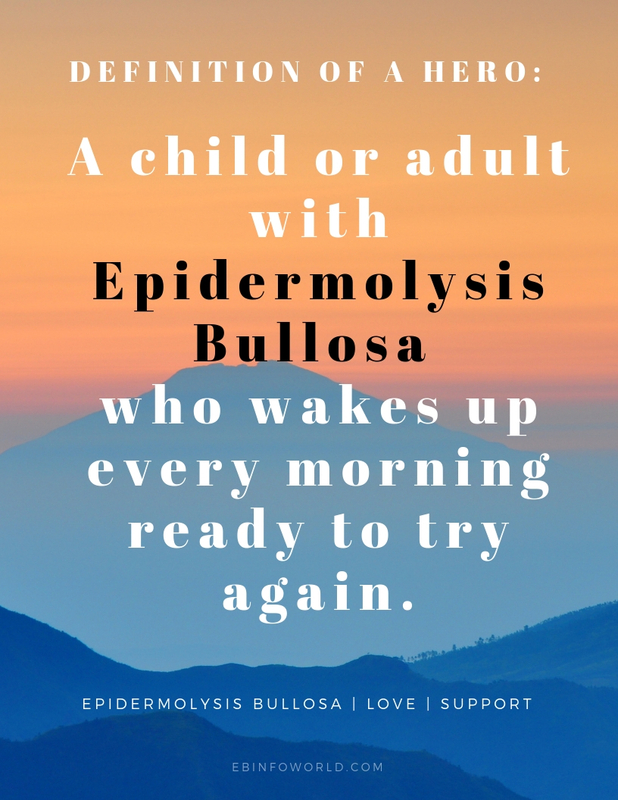 It’s interesting to note that back in the day, most kids born with severe forms of Epidermolysis Bullosa wouldn’t survive their first year of life, most had severe infections due to exposed wounds, but with the advent of better bandaging techniques and avoiding friction, these kids can live much longer. Nicky is, indeed stable overall. His wounds are not that bad and are concentrated in certain areas only. My fears of him dying from, say, skin cancer or a nasty infection, are pretty low simply because of the wound care aspect that him and I have learned to keep such a close eye to. No, my biggest fear is not that. My biggest fear is Nicky’s mental stability. My greatest fear is him telling me, one day: “I’ve had enough”. If and when that day comes, I can’t predict how I will be. Only God knows.